Bullhorn is a cloud-based CRM solution for businesses in services industries. It provides users with data capture and customer insight technology that allows them to receive the most up-to-date and powerful information at users’ fingertips. This enables them to everything they need to satisfy their clients and keep them happy. Bullhorn now services over 10,000 clients and 350,000 users, and its software solutions are implemented by a number of the world’s most prominent services enterprises to help drive sales growth, enhance service delivery, and speed up operations. Accessible anytime, anywhere, and from any device. Modern and intuitive interface that is designed to function the way humans work. Capture and document each and every interaction so that you know what’s going on at your accounts. Automatically analyzes captured data and serves up insights in real-time. If you are considering Bullhorn CRM it might also be a good idea to examine other subcategories of Best Applicant Tracking Software listed in our database of B2B software reviews. Every enterprise has different needs and requires an application that can be personalized for their size, type of staff members and clients, and the particular industry they are in. For these reasons, no software can proffer perfect functionality off-the-shelf. When you look for a software system, first be sure what you want it for. Read some Bullhorn CRM reviews and ask yourself do you need basic tools or do you require advanced features? Are there any industry-specific features that you are seeking? Get the answers to these questions to help your search. There are multiple factors that you need to mull over and these include your finances, specific business needs, your company size, integration requirements etc. Take your time, use a few free trials, and finally zero in on the platform that offers all that you require to improve your organization competence and productivity. 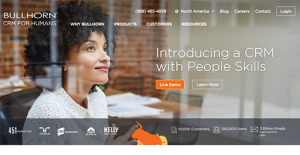 How Much Does Bullhorn CRM Cost? We realize that when you make a decision to buy CRM Software it’s important not only to see how experts evaluate it in their reviews, but also to find out if the real people and companies that buy it are actually satisfied with the product. That’s why we’ve created our behavior-based Customer Satisfaction Algorithm™ that gathers customer reviews, comments and Bullhorn CRM reviews across a wide range of social media sites. The data is then presented in an easy to digest form showing how many people had positive and negative experience with Bullhorn CRM. With that information at hand you should be equipped to make an informed buying decision that you won’t regret. What are Bullhorn CRM pricing details? What integrations are available for Bullhorn CRM? Pros: As a Sales & Marketing team, we use Bullhorn ATS, and we were extremelly happy to upgrade it with Bullhorn CRM. I mean, when you're already running an online system for your business, the best that could happen is to find a product from the same family to perform even more of your activities. We were happy to discover that the company didn't go against their reputation, and offered the same reliability seen through excellent tracking, scheduling, planning and organizing training courses for current and new employees. Cons: Nothing that bad, but there are bugs that need to be worked on. Pros: We didn’t use any Bullhorn product before, but that doesn't stop me from discovering the amazing value of the product. We just started implementation, but we're already aware of its incredible flexibility, contact management, and visibility of information. The team is just crazy about it. Cons: Implementation is taking more time than expected, and now I have to go through every system with my accountant too (I already did it with the sales person). In addition, it is never clear how far I've come, and I always have to make a retrospective in order to check whether I missed something important. I can't wait to start using it for real. If you need more information about Bullhorn CRM or you simply have a question let us know what you need and we’ll forward your request directly to the vendor.